Another week starts, and therefore so does another Fabricworm Giveaway! 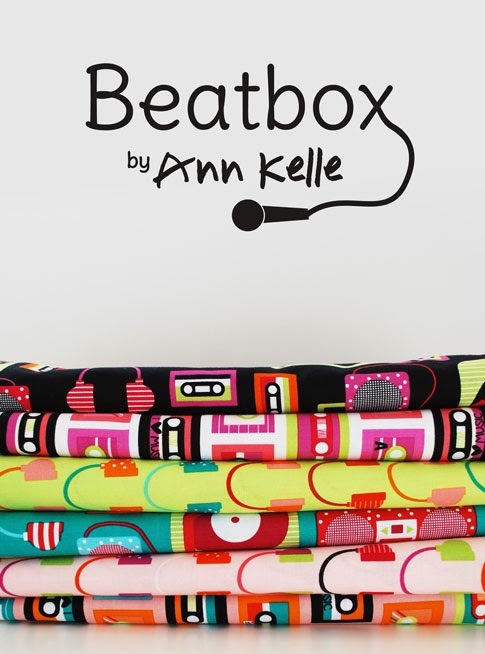 This week we're giving away a fat quarter bundle of Beatbox by Ann Kelle! We love this quirkly collection of mix tapes and boom boxes of our childhoods. The eighties and nineties are calling you! 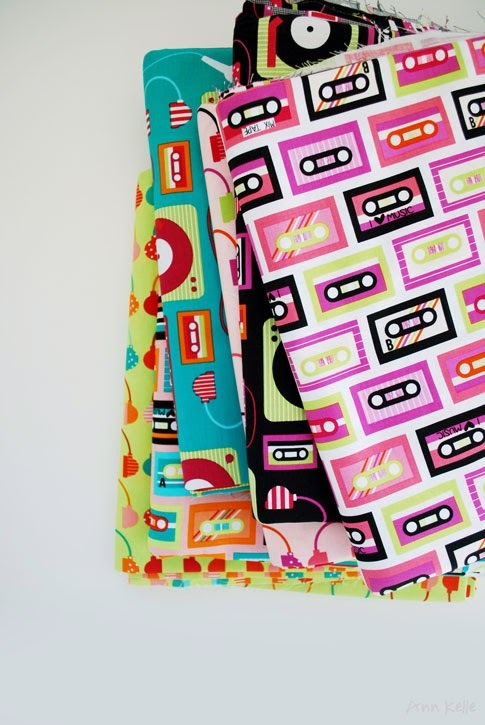 Win this bundle of fat quarters from the Beatbox collection by Ann Kelle! And check out the Beatbox Collection here. This giveaway ends on Sunday 2/2 @ 11:59pm PST. The winner will be contacted shortly after by email. The winner will be chosen by random.org through Rafflecopter. Love this fabric. I would probably collect it for a while since I would be afraid to use it! I'm not entirely sure what I would do with it yet...a bag maybe? I'm sure I'll come up with some project! I see tote bags for both my girls...they are kids of the 80s. I would make a fun skirt for my girls. This wold make a cute throw for mu niece Emily. She loves music and bright colors! I honestly don't know right off the top of my head, but I know if I won it, inspiration would call and something amazing would be made! I would probably make a throw quilt for my 11 year old daughter. These are so cute! Love the vivid colors! This fabric is so fun and I love the colours, I'd make a lap quilt for my daughter!! Bright and cheerful! Great! Thanks for the giveaway! I would SO make pillows and accessories for my daughter's room! Maybe a pillow for my bed too LOL. LOVE IT!!!! i'd make some lovely girly totes, for my friend's DD, next coming birthday. Would use them to treat her friends. I would make Noodlehead's open wide zipper pouches. Love this fabric! I would hold onto it for awhile until the perfect idea or pattern comes along for it. I would either use them in a quilt...but I think these would make some cute makeup bags! Like, super cute, fab fabric. Would like to make a rockin' quilt! Omg, I love it. Especially the cassette tapes. I'd love it in yardage to make a girls dress...but with fat quarters I'd hoard it until the PERFECT project came along. Maybe a lap quilt! I would probably make a bag and use the rest in a quilt. awesome fabric. I'd find a project to really showcase the fabric! Hey, a lap quilt for remembering the cassettes we used! My granddaughter would love a quilt made with that fabric! I'd definitely make a bag if I won this! I'd make some zippered pouches! 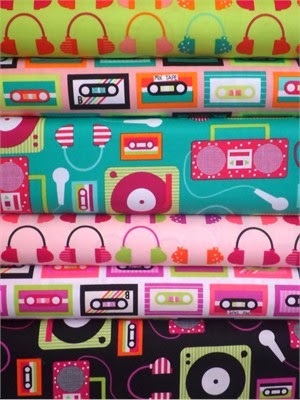 I'd make earphone and gadget cases with these fabrics. Love them. These would make a super cute little girl's tote or backpack! Some bits would be saved for I Spy quilts, but I'd definitely make a new reader cover. I would make several bags for my daughter and friends for the last day of school. I will would use them to make accent pillows for my teen daughter. Very cool. Fun! These would be great for economy blocks and things like that. Fingers crossed! These say boxy bag to me!! Oh and how funny would they be as an iPad case? This fabric is so cute. I think I would make a fun bag for my little sister. I would make a surprise gift for a friend from Grad school I haven't seen in far to long! I would make a messenger bag and other small pouches with leftover fabric. I would make some bags and pouches! I would make a some earbud pouches and a messenger bag. I would make a bunch of fun totes and bags. Thanks for the give away! This fabric is so fun! It reminds me of my sister, I'd have to make a tote for her for sure! Thanks for the chance! I would use them to make fabric bins. I'D PROBABLY MAKE NEW TOTES FOR US GIRLS! THANKS FOR SHARING! I would love to make a purse or a wallet! Or maybe a quilt for a mug rug or a placemat! I'd love to make a half-square triangle quilt! I think I'd make place mats, but would want to buy more fabric so I could make pillow cases. I'm sewing an I Spy quilt and would love to use this fabric in it. I think I would make day sized purses with metal purse frames and shoulder straps. They have a great retro feel so it would really appeal friends in my generation. These are so colorful - they would make a great tote bag set. I would make cute retro pillows for my niece's bedroom and make a skirt or two! I am a music teacher who just finished her first quilt, this looks like quilt number two for me!! Would love to win this fabric. Tote bags perhaps?? My pre-teen would definitely claim these and want a bag, pouch, and pencil case! I'd sew up a little quilt for my girls. Then use the scraps for dolls! I would make some pillow covers for my young nephew! I would make a funky quilt or funky skirt for my daughter. I would add the fabric into the I Spy quilts that I make for local charity fundraisers. I would make a dress for my niece! I see tote bags for me and my grand daughter. Love it. I would make a throw quilt for a friends daughter. How cute are those little cassette tapes? !